A teacher presents a lesson, and at the end asks students if they understand the material. The students nod and say they get it. Later, the teacher is dismayed when many of the students fail a test on the material. Why aren't students getting it? And, just as important, why didn’t the teacher recognize the problem? In Checking for Understanding, Douglas Fisher and Nancy Frey show how to increase students' understanding with the help of creative formative assessments. When used regularly, formative assessments enable every teacher to determine what students know and what they still need to learn. 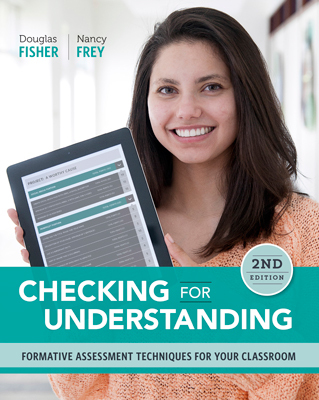 This new 2nd edition of Checking for Understanding has been updated to reflect the latest thinking in formative assessment and to show how the concepts apply in the context of Fisher and Frey's work on gradual release of responsibility, guided instruction, formative assessment systems, data analysis, and quality instruction. DOUGLAS FISHER, PhD, is professor of educational leadership at San Diego State University and a teacher leader at Health Sciences High and Middle College. He teaches courses in instructional improvement and creating effective schools. As a classroom teacher, Fisher focuses on English language arts instruction. Fisher received the Exemplary Leader award from the Conference on English Leadership of the National Council of Teachers of English and the Innovation Award from the Academy of Educational Publishers. Fisher has written numerous articles on reading and literacy, differentiated instruction, and curriculum design. His books include Better Learning Through Structured Teaching, The Purposeful Classroom, and How to Create a Culture of Achievement in Your School and Classroom. He has an English teaching credential and an administrative services credential. NANCY FREY, PhD, is a professor of educational leadership at San Diego State University. Frey also teaches classes at Health Sciences High and Middle College in San Diego. She is a credentialed special educator, reading specialist, and administrator in California. Before joining the university faculty, Frey was a public school teacher in Florida. She worked at the state level for the Florida Inclusion Network, helping districts design systems for supporting students with disabilities in general education classrooms. She is the recipient of the 2008 Early Career Achievement Award from the Literacy Research Association and the Christa McAuliffe Award for excellence in teacher education from the American Association of State Colleges and Universities. Her books include Checking for Understanding, Using Data to Focus Instructional Improvement, and The Formative Assessment Action Plan. Douglas Fisher and Nancy Frey are the creators of the foundational works of the the FIT Teaching™ (Framework for Intentional and Targeted Teaching™) strategies.